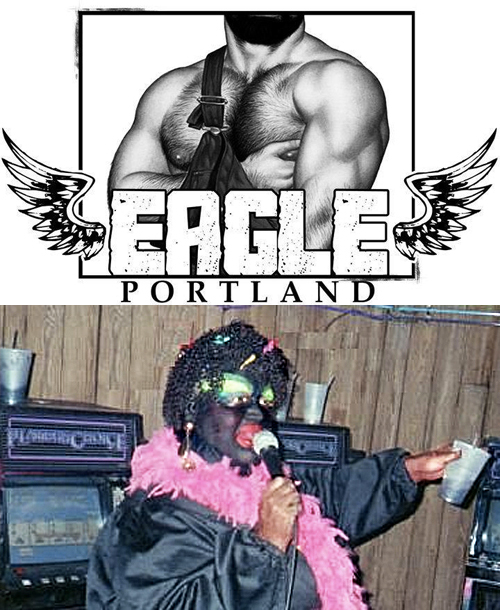 Earlier this year, gay leather bar Eagle Portland sparked an online firestorm when it announced it had booked blackface drag performer Shirley Q. Liquor (aka Chuck Knipp). Debates between those who believe the act is racist and oppressive and those who believe it is artistic, if controversial, raged locally and inspired responses from people in other states and countries. Others wrestled with the issue. Eagle Booking Manager Michael Shaw Talley cancelled the event within a day of the first complaint on Facebook, saying he had seen Shirley Q. Liquor perform on a number of occasions and never anticipated the community’s reaction. But a group of anti-racist activists called Queer Racial Justice PDX says concerns about the performance were expressed privately and ignored before the bar sold 100 pre-sale tickets. And despite the cancellation, they say, damage has been done. That’s why the group delivered a letter Friday calling for additional action from the bar. “We believe that booking this racist and misogynist event, as well as your poor handling of the outcry that resulted, has been painful and damaging to our community on the whole, to your North Portland neighbors, to African American women, and specifically to LGBTQI people of color,” Queer Racial Justice says in a release shared with PQ Monthly that includes a copy of the letter. Talley had initially said that the bar would host a community dialogue about race on the date Shirley Q. Liquor was originally scheduled for — March 15 — but that has not happened. As a result, the letter’s signers are urging the Eagle to “critically examine the ways that your actions have harmed our community, as well as work to establish a process for restorative justice.” The letter offers a number of suggested ways to do that, including attending a local anti-racism training, participating in an open conversation about racism and misogyny in the LGBTQ community, and paying $1,500 in financial reparations to either PFLAG Portland Black Chapter and/or Mack and Dubs (a North Portland restaurant that was recently the target of a racist attack). The letter says the group is open to other ideas and that it ultimate hopes to improve community relations. Read the full letter from Queer Racial Justice Portland, including a list of signers and upcoming anti-racist education events, here.